For years the best and brightest martial arts films came from Hong Kong. Such names as Jackie Chan, Bruce Lee, Jet Li, Michelle Yeoh, David Chiang and so many more shone brightly, as well as directors like Yuen Woo Ping, Chang Cheh, Lar Kar Leung, Sammo Hung and John Woo. Then, in the early 2000’s things started to change. The old Hong Kong guard either left for Hollywood to make inferior films, age, or both. With the exception of Donnie Yen, Hong Kong martial arts seemed to come strained through a filter, and the newer films didn’t seem to feature characters with real martial arts skills. Meanwhile, other countries started to showcase the martial arts of their own respective countries led by Thailand with Ong Bak and stars Tony Jaa and Jeeja Yanin, and Vietname with The Rebel, Clash, and stars Johnny Nguyen and Veronica Ngo, and South Korea with films like Fighter in the Wind and City of Violence, and of course we can’t forget Indonesia with The Raid and new superstar Iko Uwais. Now Germany gets into the game with new star Mike Moller. So how did they fare? Let’s say this: Hong Kong films need to seriously step up their game. Germany’s crashing the party! Urban Fighter follows Mikey (Moller) a man in prison who flashes back to how he wound up there, and we quickly go back in time to when he was a young gang banger who idolized his best friend Mathis, and after Mathis is killed by a group called the Bloods and their leader Slater, Mikey decides to take on the biggest gang in the city, but to do so he has to enter a fight tournament to get to Slater, but Mikey isn’t a match to even get into the tournament, and begins to train, get into other fights, in order to test his skills. Slater is aware of Mikey’s skills growing, just as the mysterious figure who operates the tournament is aware. Mikey doesn’t understand just how in over his head he really is, and Mikey soon finds he needs his friends to help him, but even they may not be enough, but even being sent to prison doesn’t stop the tournament from finding him, but why? The story to the film takes a little while to ramp up, but when it does it gets good. The early scenes with the 80’s style biker gang is a little silly (especially since we know Mike Moller’s wearing a wig) but the film greatly improves after Act 1. If there is one thing that was odd, and it was an attempt by the film to cater to an English speaking audience. The problem here is that everyone is German with strong accents, and at least I found it difficult to understand at times. Mike Moller does a good job as Mikey, starting off being an immature hothead, but as his martial arts knowledge expand, so does his maturity, and Moller is able to pull this growth off. Volkram Zschiesche is also good as Slater, playing the bad guy with gusto and fun. The other actors varied from okay to not very good, and I think speaking English may have hurt some performances. Now, I don’t know who Psycho Dog Bros are (Mike Moller is the head) but they certainly learned from Panna Rittikrai (The Protector, Ong Bak) when it comes to fight choreography. The fights start off weak at the beginning, which is appropriate since Mikey isn’t good with martial arts at the beginning, but as the film goes on it gets better and better until the actual tournament, where is just becomes a stellar showcase of martial arts of many different styles, and the camerawork is perfect in these scenes. In many respects the film pays homage to past martial arts films like Ong bak and Bloodsport, even going so far to recreate one of best scenes in Bloodsport shot for shot, and it was a blast to see. The next to last fight also features a free-for-all involving escrima sticks and short staffs which was also great, but nothing beats the tournament scenes. There are also some very well done parkour scenes, very much on the level of District B13, so they covered all of the bases! The advertisements claim the film is shot in the style of Ong Bak, and while they don’t hit the greatness of that film, they come pretty close, which is no small feat. The biggest real problem I had is that the film has an open ending. Hopefully a sequel is on the way. CHOREOGRAPHY: (9) A fantastic job by Mike Moller and crew. The tournament and stick fights are really well done, and would make Panna Rittikrai and Yayan Ruhian give them a thumbs up! 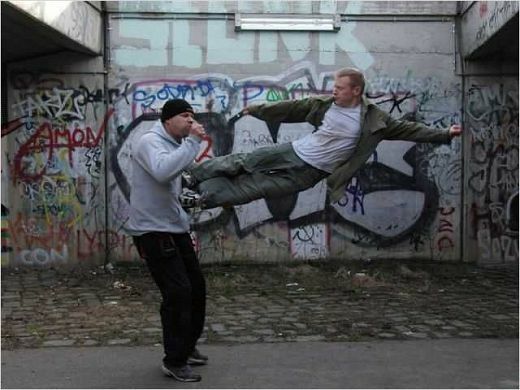 STUNTWORK: (9) The stuntmen certainly took it like the Ong Bak guys do, and really tossed themselves around with gusto and flair, and had good reactions to the strikes and kicks. STAR POWER: (6) I had never heard of Mike Moller prior to this film, but he has done a lot of German TV and film as a stuntman. After this film, that’ll change. FINAL GRADE: (8.5) The first act somewhat hurts this film, but the second and third acts more than make up for it with fantastic martial arts action and a new star in Mike Moller! NEXT: Cyril Raffaelli and David Belle run their way to victory in District 13: Ultimatum! The Urban Fighter (also kn0wn as Street Gangs) DVD/ Blu-Ray will be released on July 27th, 2012 in Germany. US release is scheduled for June 6th in selected theaters. Looking forward to seeing this film. 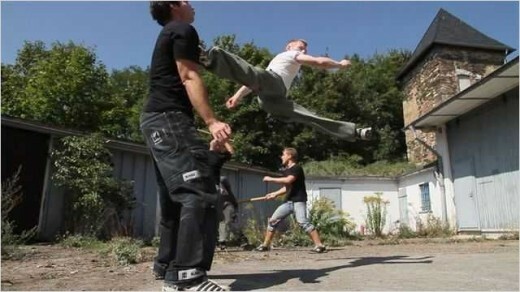 Martial Arts training is certainly becoming the thing of the hour. To learn the stuff that Jason Stratham, Bruce Lee, Jet Li and Donnie Yen have mastered where can we go? There are schools in the area but not of the caliber to learn what the Masters know. My research points to the fact that those cats have studied the martial arts since they were very young. I wish I knew the martial arts in high school. We really need this type of a thing in many communities out here in San Francisco. There are so many overweight kids. Health disparity needs to include this form of practice for kids. Florida, Mississippi, Alabama, Arkansas, Louisiana, Georgia, Tennessee, Kentucky have a great deal of obesity as well. I am doing the studies in rural areas in these States and it is absolutely amazing how many really overweight folks to include babies, children and youth there are. We ought to set up martial arts schools as artistic and cultural initiatives with a health disparity kick for said communities. I am sure there are other areas all across this country. Put in some work on the research end of this idea.